Dennis Troha, a Wisconsin trucking executive that paid Alaska Congressman Don Young over $20,000 in illegal campaign contributions, was sentenced to no prison time Friday, due to his pledge to testify against Young and other corrupt politicians that he bribed. A federal judge in Milwaukee sentenced Troha to six months probation and gave Troha no monetary fine. Troha has admitted funneling illegal donations to politicians who could help him reach build a casino in Kenosha and relax federal trucking rules. U.S. Attorney Steven Biskupic recommended probation, he said, because Troha has helped his office and the FBI in their ongoing investigation of campaign finance violations. He credited Troha with bringing in three cases: two subordinates and Kenosha County Executive Allan Kehl. "He provided information on three significant cases, and there will probably be more," said Biskupic, who estimated the FBI will be investigating the information Troha has provided for the next year. "They (Troha and his subordinates) have been a deep well of information regarding illegal campaign activity." Troha faced up to two years in prison. Biskupic asked for a lighter sentence in a recent court filing, because Troha had provided "substantial assistance" to prosecutors during their investigation of the conspiracy. 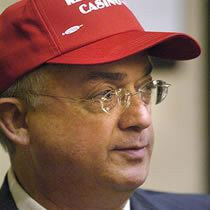 Troha pleaded guilty in July to two misdemeanor campaign finance charges.